Discerning dwellers can choose from 3 types of residential units which differ in size to suit their preference. Available in 3 unit types: M1, M2, and M3 on different sizes of land: 289, 297, and 350 square wa. 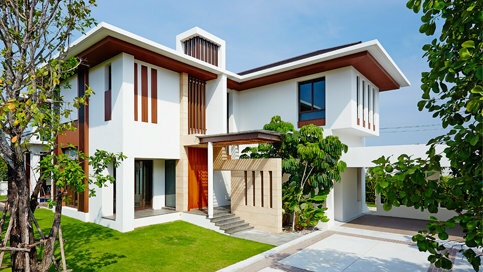 Each unit has a utility space of 626 square meters with the front door of the house faces the southeast. Available on different sizes of land: 400 – 448 square wa with a utility space of 935 square meters. Type L1 – L5, L10: The front door of the house faces the southeast. Type L6 – L9: The front door of the house faces the north. Available on different sizes of land: 399, 600, 602 square wa with a utility space of 1,205 square meters. Type XL1: The front door of the house faces the southeast. Type XL2 – XL3: The front door of the house faces the north.